At EHS Support, we know we impact the world around us, both as individuals and as a company. That’s why our team is committed to investing our time and resources to an array of organizations and worthy causes. We encourage our employees to give back to the local communities where they live and work. Whether its mentoring local students, coaching sports teams, or volunteering at a non-profit organization, we empower our employees to champion causes they are passionate about. EHS Support was proud to sponsor the Franklin Regional School District Science, Technology, Engineering, Math (STEM) Team. The theme for this year’s competition was “Improving Pennsylvania through STEM and 170 regional teams were challenged to design a device or project to improve the quality of life for citizens in Pennsylvania. 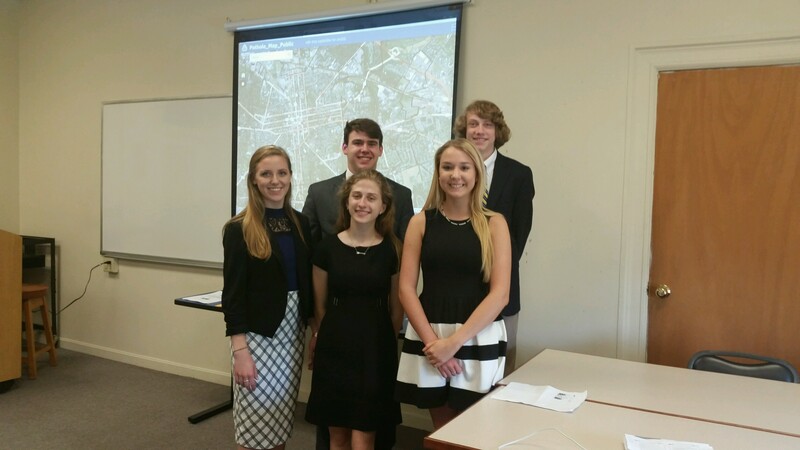 The Franklin Regional team addressed the pothole problem and worked with Alex Smith from EHS Support to build an interactive pothole mapping application for Android mobile devises using ArcGIS Online that lined directly to an interface with the municipal road authority. The Franklin Regional team was one of 25 state teams that qualified for the State-Wide competition and they were selected as one of the six state finalists to compete for a top award – which was a significant accomplishment. It was great opportunity to showcase their talents and certainly an experience this team will not forget. Congratulations on a job well done!